This is the time of year when people sidle up me at the growers market with a desperate look in their eye and beg me for any and all recipes for zucchini. This is also the time of year when anonymous bags of squash get left in my car during the night, but I try not to encourage that sort of thing. Eat Local Month also kicked off on Monday and nothing is local than the produce in your own back yard. I’m not sure what it is about zucchini – you put a single plant in the ground and next thing you know, you have 80 pounds of squash. I’m fairly certain the solution to the peak oil crisis will involve zucchini in some way. Until then, here’s a great recipe for using up zucchini that doesn’t involve muffins or bread. The recipe comes from the excellent cookbook Passionate Vegetarian by Crescent Dragonwagon. The recipe is also known as “The Gardener’s Solution”, so there have been many attempts to solve the zucchini conundrum. The advantage to this one is that is uses both zucchini and tomatoes, so if you’re also dealing with a bumper crop of those, you’re in luck. This recipe can be tweaked in several way, depending on preferences. Use a vegan parmesan if that’s what’s needed, add a little tuna or shrimp if more protein is desired. It can able be made more Greek in flavor, but adding dill and olives and swapping out half the parmesan for feta. Vegetables are pretty forgiving, so feel free to play around a little. To start, find the most obnoxious zucchinis in the the garden. Failing that, several of nice medium-size are ideal. Too big and the flesh will be woody, too small and scooping them out is a pain. Once the squash have been identified, cut them in half long ways (north to south, not through the equator) and blanch them in a pot of boiling water for a minute or two. Blanching is important because it helps remove the starchiness and softens the flesh for scooping. After blanching, scoop out the middles with a melon baller or grapefruit spoon. Leave about a third to half an inch of flesh on the sides. You’ll have a nice little collection of zucchini canoes. Chop the innards finely and set aside. The rest is easy: everything is stir-fried, then cheese and breadcrumbs are added. Spoon the mixture into the scooped out zucchinis and bake. 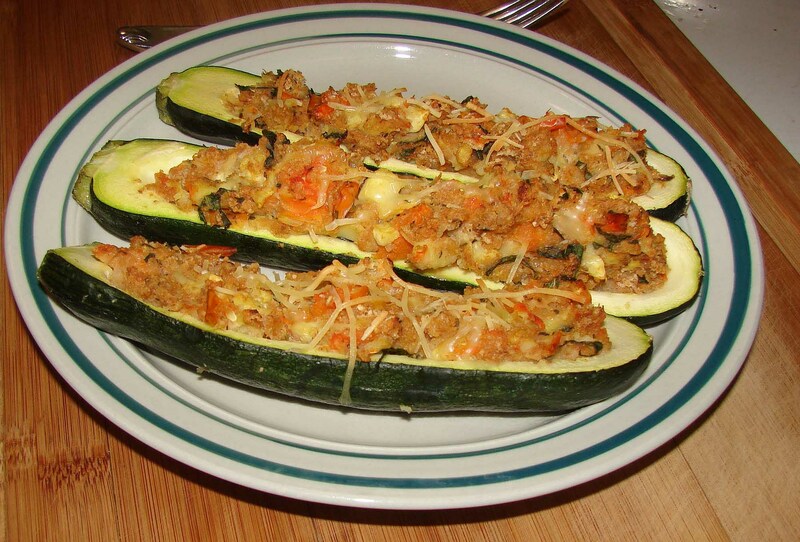 The result is a stuffing-like, cheesy mixture that pairs really well with the mild flavor of the zucchini. 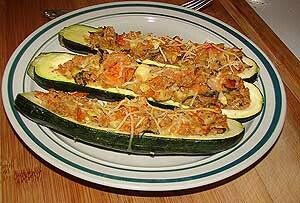 The filling and the zucchini can be prepped in advanced, then assembled and baked before serving. The can also be prepared up the point everything goes in the oven, but then stored in an airtight container and frozen for eating later. Fr more information about Eat Local Month, visit the good folks at Briar Patch Co-Op. They have all their local products labeled and will be happy to answer questions. 2. Scoop out the flesh of the zucchini, leaving 1/2 to 1/3 inch of flesh on the outside. Finely chop the scooped-out flesh. 2. Heat the oil in a large skillet over medium heat. Add the onion and sauté until soft, about 4 minutes. Add the scooped-out zucchini and saute for 2 minutes. Add the garlic, tomato and bail. Saute for another minute. Add the breadcrumbs and remove from heat. Add the cheese and season with salt and pepper. Stir well. 3. Spray a baking dish with non-stick cooking spray. 4. Spoon an equal portion of the filling into the prepared zucchini, patting it into place. Place the stuffed zucchini into the dish, cover with foil and bake for 20 minutes. Uncover and bake an additional 10 to 15 minutes, until the crumbs are browned and crisp. 5. Remove from the oven and serve hot or at room temperature.